What is it with YA fiction and the apocalypse, anyways? I mean, that’s not what we’re talking about today, but it’s starting to bug me. Are we utterly convinced that all teenagers think adulthood is nothing but an endless stream of dystopian societies and monochromatic clothes? It’s getting weird. Anyway. Like I said, not what we’re really discussing today. Though it is interesting. 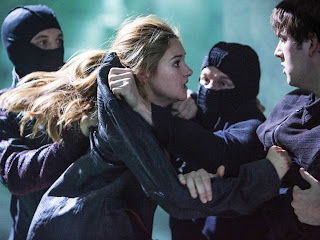 Nope, today I want to talk about Divergent, the dystopian YA novel by Veronica Roth that will, as of March 2014, enter into a comfortably populated landscape of YA adaptations and popular films. It’s coming out right at what I assume is the height of the trend, on the heels of both the Hunger Games sequel, the City of Bones film, and before the release of The Maze Runner, all wildly popular YA franchises making their forays into the film world. Which leads to the big important question we have to ask ourselves: is it going to stack up? And why? Hunger Games is the rare property that has made the transition from beloved teen series to popular movie juggernaut easily. For every Hunger Games, there’s a City of Bones or a Percy Jackson and the Olympians or even an I Am Number Four (which I have not seen, because it looks like crap). As much as Hollywood is tempted to take every semi-successful book series with a built in fanbase and spin it into a bunch of movies, we have to ask ourselves an important question after a while: Are any of these books actually worth adapting? Now, you have to let go for a second. When I say that something isn’t right for adaptation, that is not me saying that the original is bad. Not it at all. A book or comic or radio show’s quality as its own entity has precisely zero impact on whether or not it will make a good movie. Really. Why? Well, to understand that then you have to understand something very basic about film in general. To wit, film is a very particular language of storytelling. TV is also a specific language, and so is prose (novels) and radio and comics and poetry and what the crap ever else. We choose the medium in which to present the story because it fits the story at hand. When we change the medium, we by necessity change the story. Think about it. When Hunger Games went from a novel to a movie, some things changed. Oh, there was the superficial stuff. They cut a few characters, added in some screen homages here and there, messed with the costumes, that kind of thing. But it’s really much more fundamental than that. The book is written in first person perspective. That means that the whole time we’re reading the story, we’re inside Katniss’ head. We know exactly what she’s thinking and why. We never have to worry about relating to our character fully because we’re right there. We know here, and we never know anything outside of her. Not really. In movies you don’t get that. So when you watch the Hunger Games movie, all those moments when originally we were inside of Katniss’ head and we know how she’s feeling, well we don’t have those anymore. Instead, the filmmakers have to improvise. They have to figure out how to get the same feelings across without the same method. And that requires adaptation. Additionally, things that work in a book, like long sequences of introspection, or monologues, or lots of characters sitting around and talking, or even word games and literary motifs – none of those things transfer over well. We hate watching movies where characters just sit around. Lots of exposition? Dull. And word games? Completely gone. As a result, any movie based on a different property is going to come out of the filmmaking process looking just a bit different. Sometimes a little, sometimes a lot. Sometimes whole swaths of the original are gone. Sometimes new stuff has been added. And sometimes it just feels like they kept the title and changed everything else. It can be good, it can be bad, it can be whatever. All you know is that it’s different. 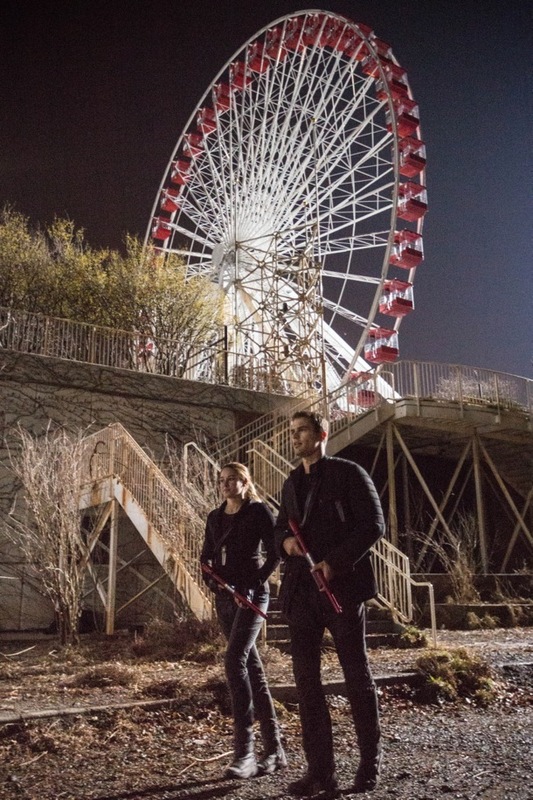 Which brings us handily back to Divergent. There’s a film coming out in March of 2014, and what I want to know, desperately and deeply, is how they plan to deal with this. How are they going to change the story to make it fit a new medium, and is it going to work? So, down to the basics. 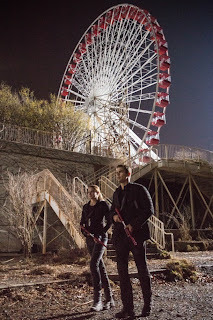 Divergent feels familiar, because it is. It’s a YA dystopian romance coming-of-age story with a female protagonist set in a semi-postapocalyptic future. It’s very good. But it’s also very familiar. Our heroine, Tris, lives in a new society built on the shell of our own, where everyone must choose their future at the age of sixteen. You can belong to any one of five factions or you can become factionless (a fate worse than death, we are told). Faction is more important than family, so choose wisely. You will be given a test that tells you where you fit best, and then you will make a choice. The factions each value different personality types, like the Hogwarts houses, only angrier. Abnegation values selflessness, Amity values kindness, Candor likes honesty, Dauntless rewards bravery, and Erudite loves knowledge above all else. There is no middle ground. You choose a faction, and you stay with them until you die. Tris comes from Abnegation, but she’s never felt very selfless. While she toys with the idea of choosing her faction and therefore getting to stay with her family, she feels like she doesn’t quite fit. 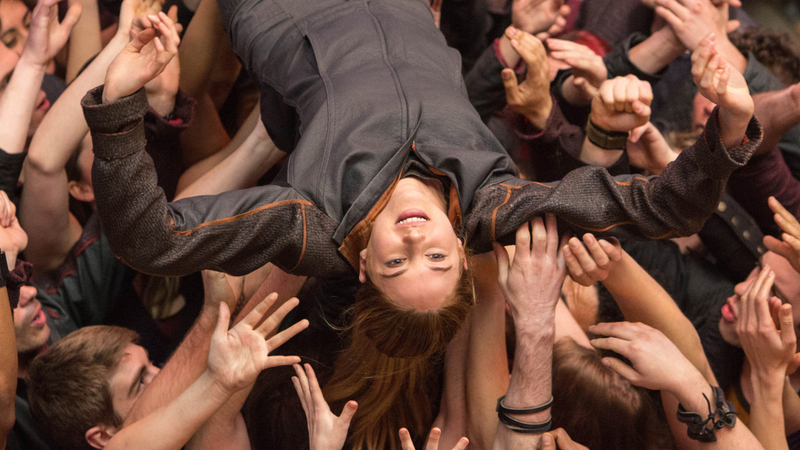 Her aptitude test comes back inconclusive, or “Divergent”. It means that she doesn’t have a category. The choice is wholly hers. She chooses Dauntless and quickly begins their initiation process. It takes up most of the book, with trials and classes, learning how to be brave and overcome fear. Very interesting to read, of course, but might have some trouble crossing over. Along the way, she makes some friends, falls in love, and oh yeah, accidentally uncovers a conspiracy and finds out just how important it is to be Divergent. I can tell you a couple of things off the top of my head about the book. First, I really liked it. It’s well written, engaging, and I had trouble putting it down. So good job there. Granted, I usually have trouble putting books down, but this one actually caught me up in the drama, so that’s nice. Second, Tris is a pretty good character. She’s brave, which is always intriguing, but she isn’t really very brash. She has flaws, an admirable talent for self-sacrifice, and some deep-seated insecurities. I approve of a well-written heroine, and while she does occasionally tip over into blandness, for the most part she’s clever, interesting, and likable. So good job there too. The third thing is simple: I have no idea in hell how they’re going to make this an engaging movie. Oh, don’t get me wrong, I’d very much like to see them do it. I like this story, and I hope it does well. The trailer looks intriguing, the casting seems very well done, and the screenshots they’ve released all look good, it’s just…How do they plan on translating that story above, that massive pile of exposition which only really works in novel form, into a two hour film suitable for most ages? Part of what makes this book good is that it grapples with deep and meaningful philosophical questions. The idea that bravery, true bravery, is a form of selflessness, and that it’s only by accepting ourselves, our whole selves, we can be strong. What abuse does to a person. What it means to have power. What control really and truly is. All of those are questions that thread through the book. They’re important questions, and they’re very well asked. But how does that play out in a movie? 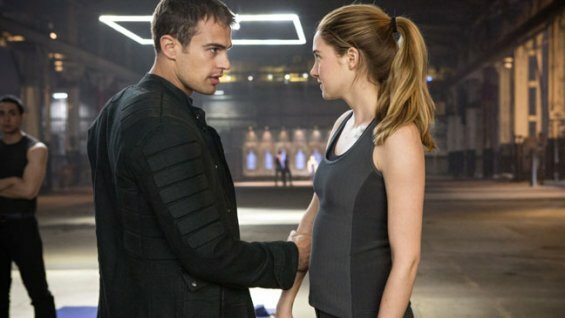 Are we going to have scenes where Tris and Four hold forth on the merits of bravery? Will and Christina debating ethics while they sprint through a maze or something, just to keep it interesting? What I’m terribly afraid will happen is actually simpler than that. I’m afraid those questions will be lost. There’s quite a lot of story here without the deep stuff. Tris’ journey is heroic and cinematic and they don’t need my help figuring out how to make it look good and shoot well. They’ll get a crowd-pleasing film out of this, that’s not what bothers me. I’m just afraid that in the process they’ll lose everything that actually makes this book special. And that would be a damn shame.